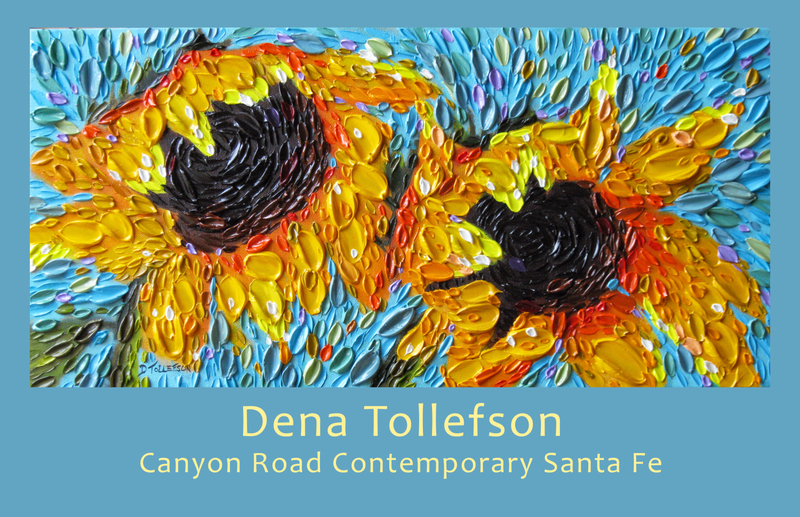 Come see 8 of Dena Tollefson's original highly textured paintings at Adelman Fine Art in San Diego, California. This beautiful boutique gallery is located in the tony Little Italy section of the city. Please stop in and say "hi" to gallery owners Phylicia and Nicole! I created a short video for you showing the making of this painting. 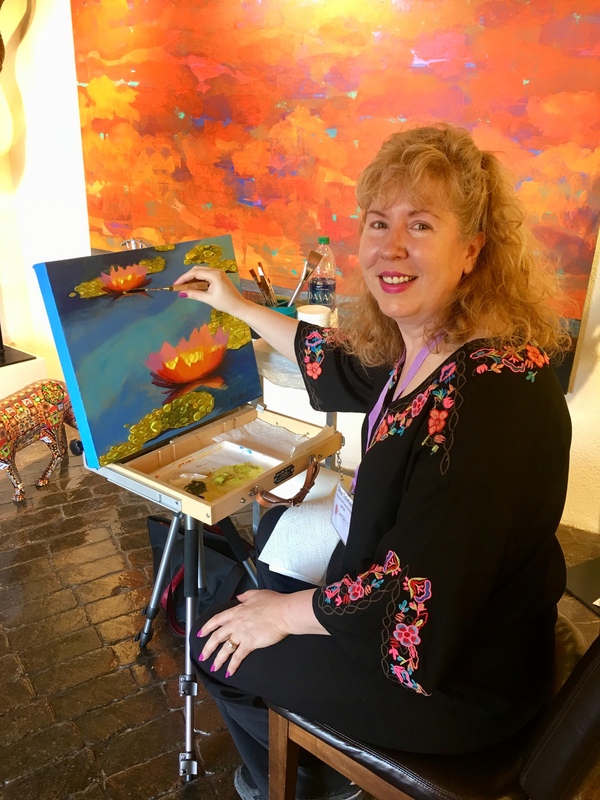 Search for Dena Tollefson on YouTube, or click on the link above to find videos of my painting technique and process, set to soothing music. Please watch my videos and leave me a comment. I would love to hear from you! Adding some more daubs of paint to my Monarch butterfly painting. I am trying to capture the joyful flight and yet delicate nature of the Monarch. Our local county- Linn County, Iowa- is working with private individuals and corporations to help conserve, nurture, and support our butterfly population. Thanks to Nancy Ouimet and the staff at Canyon Road Contemporart Art in Santa Fe, New Mexico for a wonderful opening reception for my solo exhibit! In photo above, I am doing a demonstration of my signature daubism technique inside the gallery. In front is a peek of a sculpture by Adam Rees and next to me is a landscape painting by Mark Bowles. Up Close and Personal with my new painting, "Barnabas's Sky"
Detail of my latest Sky Series painting "Barnabas's Sky"... You can see the texture of the strokes of paint created with a palette knife. The largest daubs are made with a spoon. What is your favorite butterfly? Sneak peek! 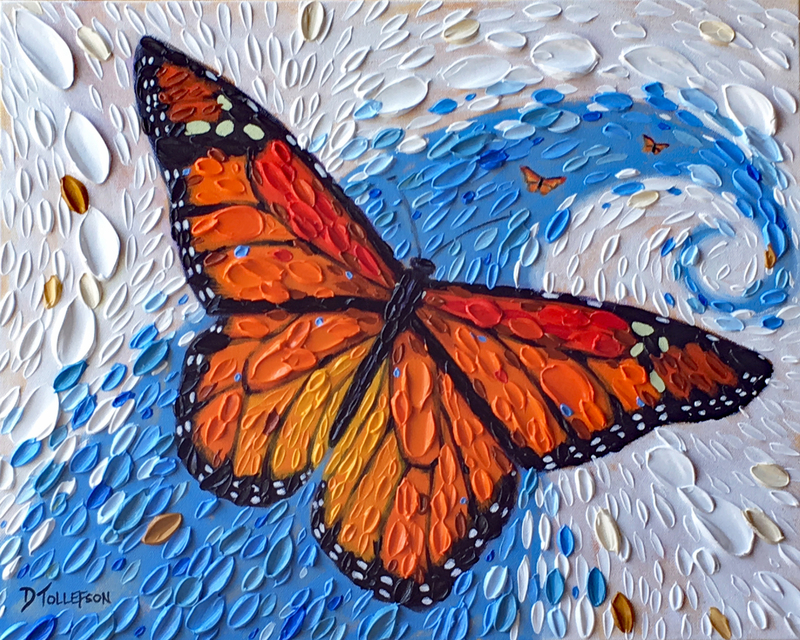 This Monarch is the first of a new series of butterfly paintings. I am taking a poll- what is your favorite butterfly? 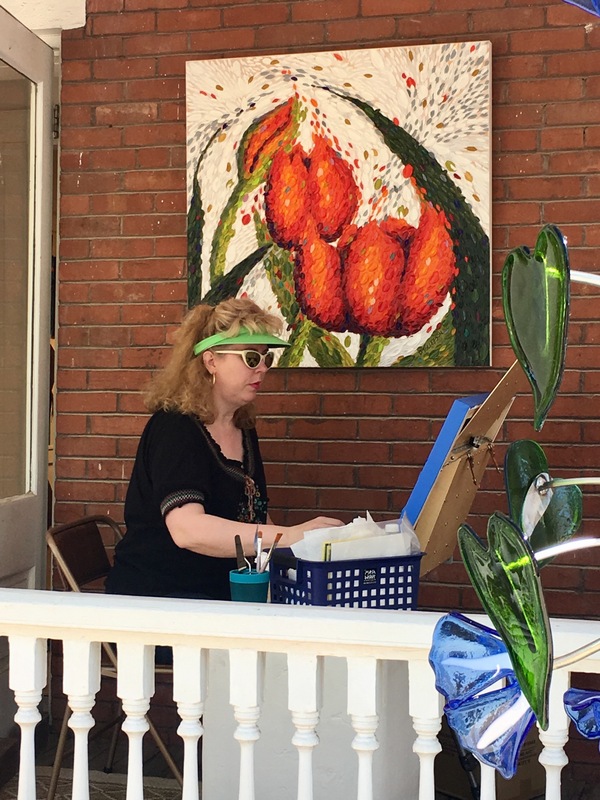 Please let me know by sending me a comment on Instagram or on my Facebook Page- Dena Tollefson Art. Votes received so far include favorites of Monarch, Yellow Swallowtail, Luna Moth, and the beautiful Blue Copper Butterfly. I am excited to finally complete my latest Daubism painting- this one is called "Peaceful Garden". It is oil on canvas and now needs 5 months of drying time in my studio before it can go to its forever home. 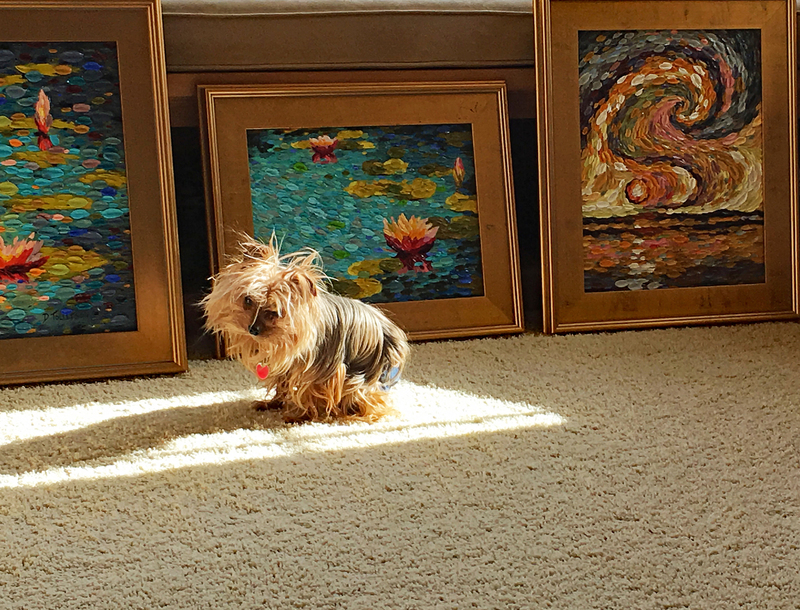 Studio dog Muffin Tollefson stands sentinel as paintings are lined up for shipment to Artists' Showplace Gallery in Dallas, Texas. 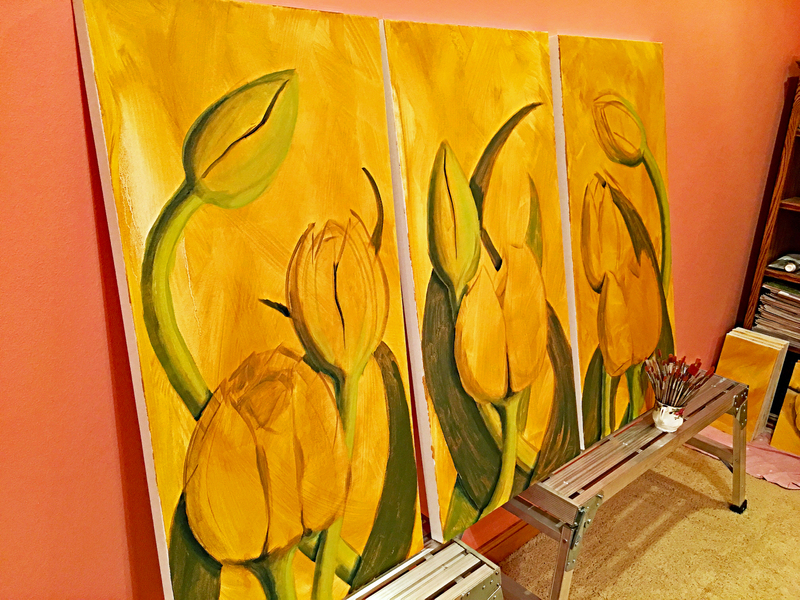 Adding thick, juicy daubs of white oil paint on the large tulip triptych. 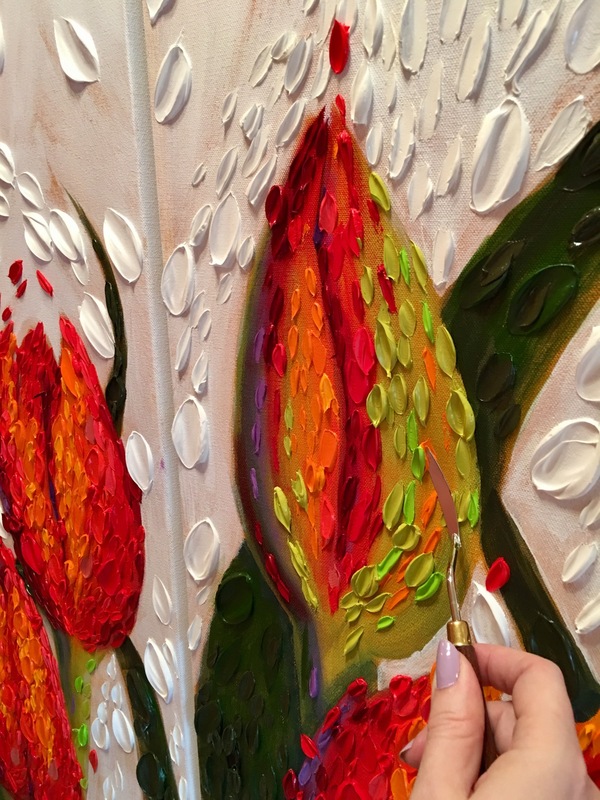 I am mindful of how and where I am placing the strokes of paint, my goal is to accentuate the feeling of movement in the painting and create a feeling of a mosaic. If you look closely, you will notice the area on the bottom right side of the painting has a section of plain white canvas in need of attention. 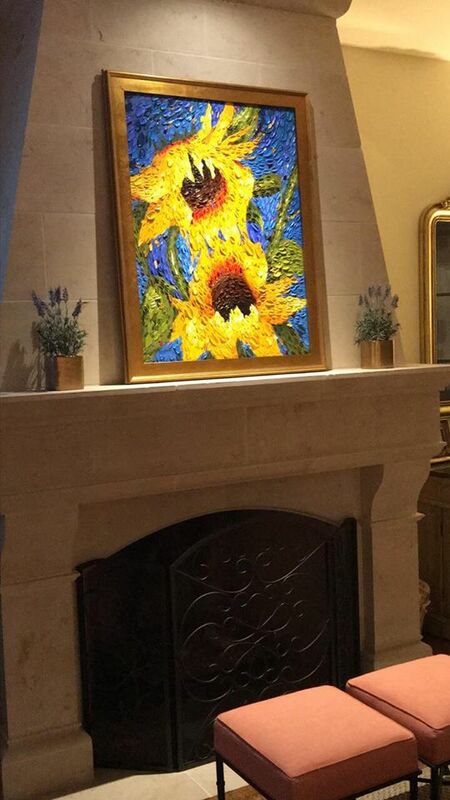 What are your thoughts on mosaics? Mosaic is the thousands-year-old art technique of assembling small stones, glass, metal or other materials into a pleasing permanent pattern, with origins in early Mesopotamian and Roman art. There is a textural contrast and depth between the materials and ground. 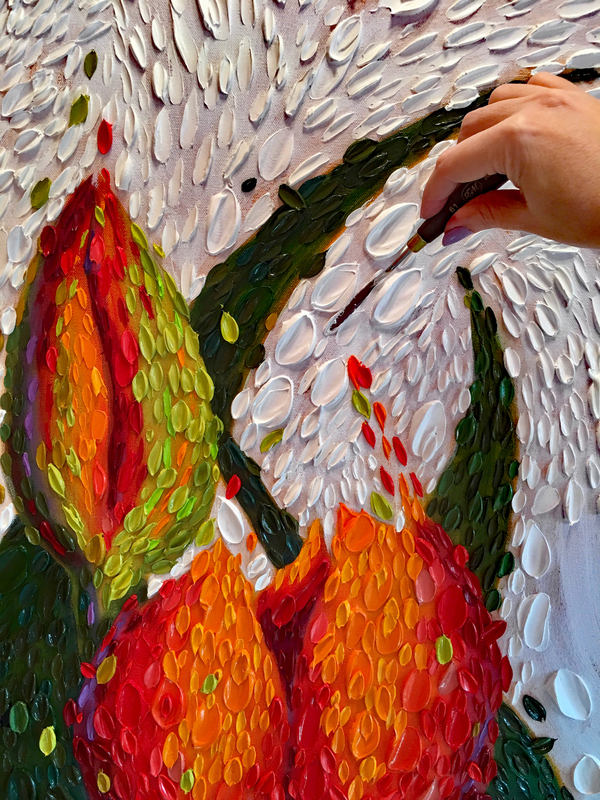 I find mosaics fascinating how the individual pieces all contribute to the whole- I want my paintings to have a similar idea where overlapping petals of paint all stand on their own and then contribute to the total. 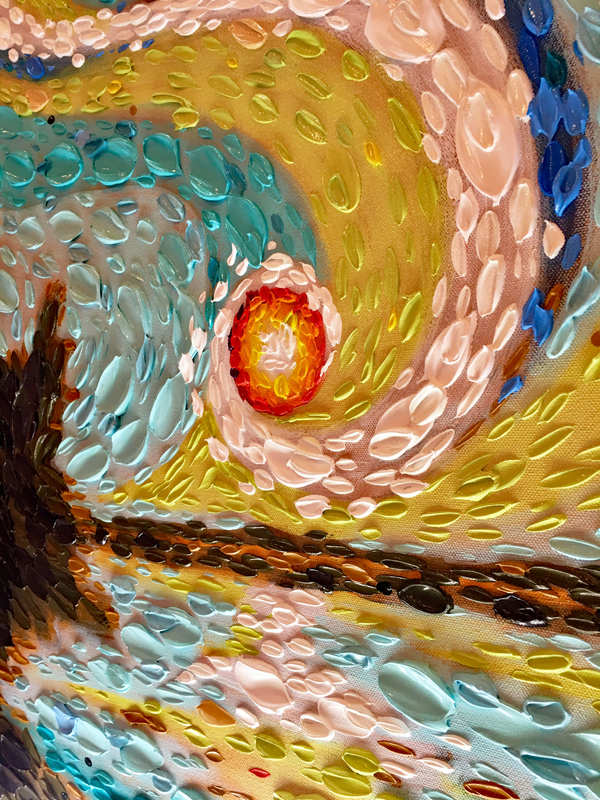 In the painting technique Daubism I developed, I am going for a low-relief sculpture in paint- a mosaic of oil paint daubs on a smooth oil paint ground, with all the little daubs working together to form one overall image. 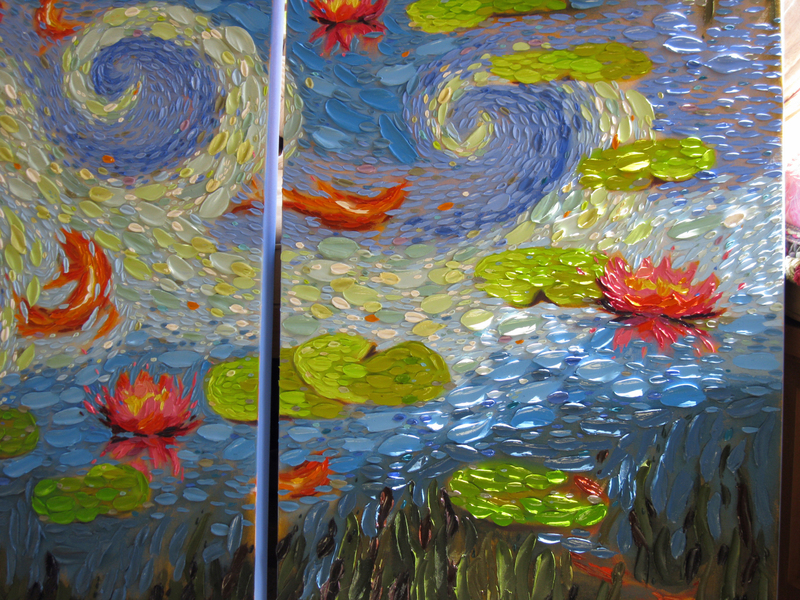 Shown here is a detail closeup of my painting "Breath of Heaven: To Frolic" The painting is 48" tall and 72" wide. I hope you see the influence of mosaic in my work, especially in the waves. 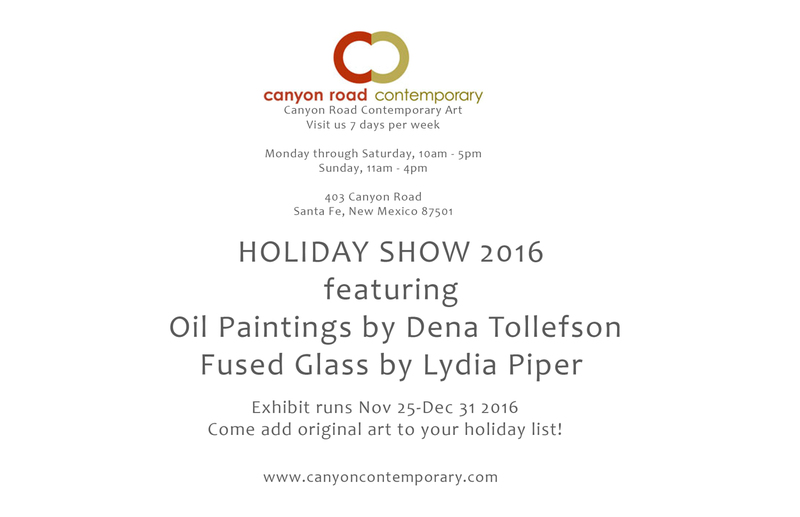 I'm excited to announce Lydia Piper and I are featured artists at Canyon Road Contemporary Art Gallery Santa Fe's 2016 Holiday Show! 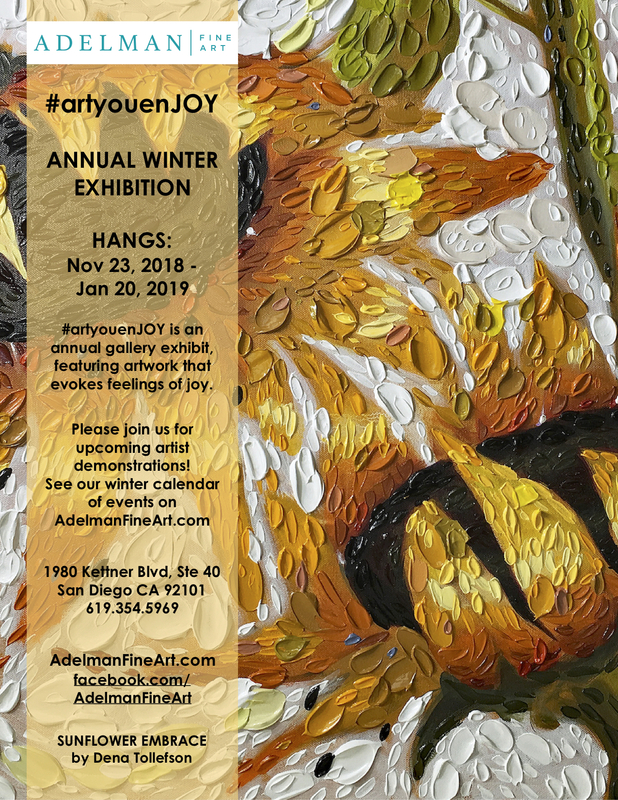 Featuring sculptural oil paintings by Iowa artist Dena Tollefson and kiln formed glass by New Mexico artist Lydia Piper. The 2016 Holiday Show begins on Black Friday, November 25th and runs through December 31st. Come add original art to your holiday list!